Abu Dhabi was the site of my 3rd marathon run in less than 36 hours! Find out about this toughest of runs on my 6 marathon / 6 continent / 5 day adventure – including what it was like to run in 108 degree weather! As I wrote about recently, in 2015, I had run a solo event of 6 marathon runs on 6 continents in 5 days. Due to various things, I had never quite finished the posts about this intense event so I am picking up now with the 3rd marathon run – Abu Dhabi. The third leg of my effort to run 6 marathon distances on 6 continents in under 5 days took me to Abu Dhabi, UAE. I had done a scouting trip about a month before this event to check and see where I would end up running and had also contacted a running group in the area. Due to the heat, their insurance would not permit them to participate or help in any way (should have given me a big hint about the heat!) so I knew I would be largely on my own. 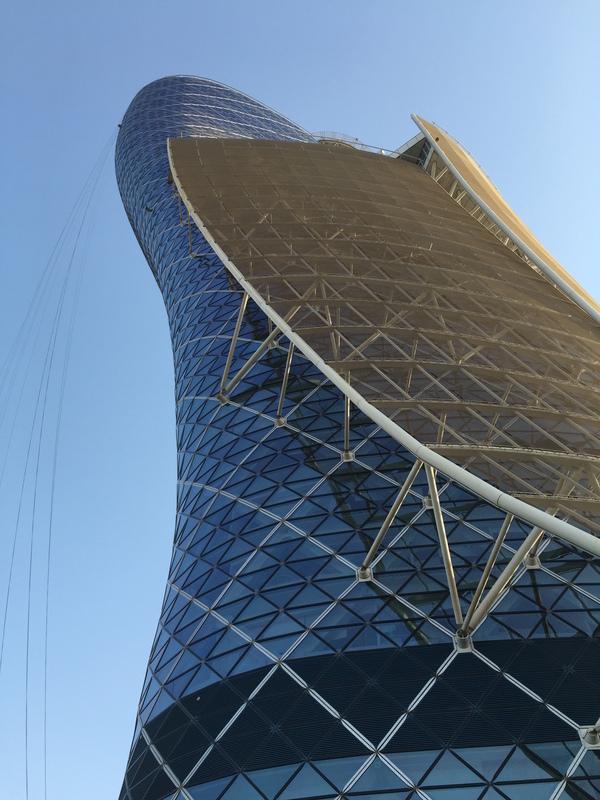 Due to the many things that could go wrong, I chose a roughly 3 mile loop with the base of it at the fantastic Hyatt Capital Gate Abu Dhabi. Going into this event, I knew that this was the one I was most nervous about. There were several factors that came into play with this anxiety. Some of them were that it was my 3rd marathon run in less than 36 hours, I had less than 2.5 hours of sleep since I started marathon run #1 (in Greece), the temperatures were well over 100 degrees at the start and the humidity was very high, and I had a slimmer window for finishing this run than I had the other ones. Thanks to Jeff Zidell of Hyatt, the staff at the Hyatt Capital Gate were expecting me and had a ton of water already stashed in my room for me. I simply went up to the counter and they already had my room paperwork done so they simply handed it to me and I went up to change. When I came down, I had the pleasure of running with 3 of the staff members from the Hyatt. Given the extreme heat (108 degrees at the start), I was humbled to have people join me in that heat. It made for a lovely start of the run to have the company and I really enjoyed it! We headed out and I ended up with a little over a 3 mile loop that went through the business area, past a convenience store/gas station/McDonalds (very important – more on that later!) and kept me on sidewalks in the higher traffic areas. It was a tough decision – how fast to go? I knew that I did not have a lot of time (I started at 3:34PM) but I also knew pushing it too fast with the sun still up would not work well later on. I kept it somewhat steady for the first couple of loops and actually went through all of my water by the end of the first loop! That was where the convenience store came in handy. Every lap or so, I would head in there for another bottle (big one!) of water. It was really neat to become extremely familiar with the same 3 mile stretch of a foreign city in such a short span of time! 🙂 However, that familiarity also caused me to go into more of a mechanical mode. I had run in desert heat before (Death Vally in July) but dealing with humidity is not something I handle well and it was taking its toll on me. Also, the lack of sleep played into all of this as well. I did more walking after every couple of miles with the only goal being to finish the run and get to the airport before the plane left for Sydney. This was not about speed but rather about finishing the run in the timeframe I had to make the next flight. It was interesting to see the outdoor workers watching me as I would see them ever 3 miles. During the time of the sun being up, they were more in the shade and just kept staring at me like they wondered what in the world was wrong with this foreigner! 🙂 After a few laps, they actually began to clap for me each time I came around. That was so cool and really appreciated as gestures of kindness like that helped me to get through the tough parts. This was the part where I had to kick it into higher gear. Where the first 18 miles were done at just under a 12 minute pace per mile, the last 8 miles were done at just under 10 minutes per mile. This was necessary because I knew time was getting away from me. Going into this run, I knew it was going to be so tight that I even had to cancel the chauffeur provided by Etihad (which they do not provide to partner award ticket holders anymore) since they would not agree to pick me up so close to departure. I kept looking at my watch and thinking “How in the world am I going to make it to the airport with this little time left?!”. Well, I finished but it certainly wasn’t pretty! I raced inside to grab my gear and change – only to find the door to my room would not open. I called down to the desk and they came up and said they had gone into to refill my water and had noticed that I had left money on the bed. For security reasons, they locked out my keys and cards to make sure that I would have one of the staff with me when I went through it to make sure I was in agreement that nothing was taken. While I understand that, it certainly made me feel more pressured time-wise! I grabbed my stuff and hopped in a waiting cab. I was dropped off at the premium passenger entrance, quickly made my way through passport control and was off to board the best flight of my life! A New Emirates Route That Should Be Interesting – Newark and Athens!